Post real-time news in a familiar social media style. Maintain safety in your own secure environment. Target specific parents and groups. Share to various forms of social media, as well as your own website, with just one click. Targeted messages, with optional 2-way functionality. Reviewing of message activity to understand whether messages have been opened, read or actioned. Collaboration with all stakeholders across the school, including school staff, parents, students and governors. 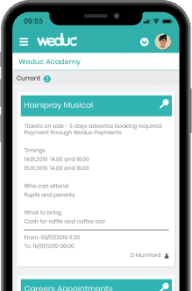 Synchronise whole school events with the school website. Target specific groups around additional activities such as clubs. 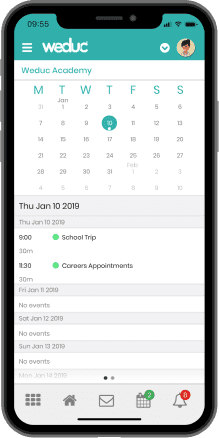 Office and Google calendar integration. 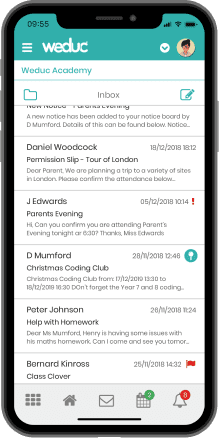 Set automated reminders via in-app messages, SMS and email. Recycle templates and save precious time. Create a whole school communication strategy. Trigger push messages to achieve instant interaction. Contact information confirming accuracy, complying with GDPR regulations. 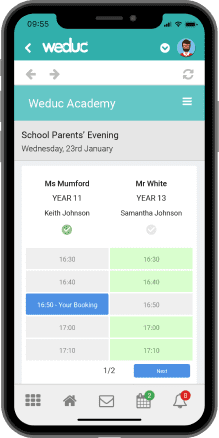 Attendance information with comparisons across the school. 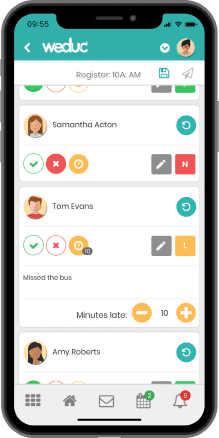 Alerting parents instantly, and have them book their appointments on their mobile device. Remind parents of upcoming appointments. Eliminating children screening their own appointments. 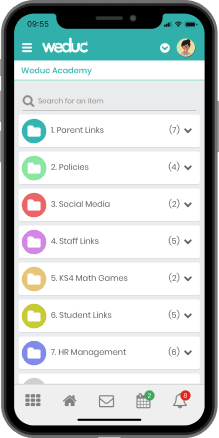 Allow teachers to add notes in real time, on the evening. 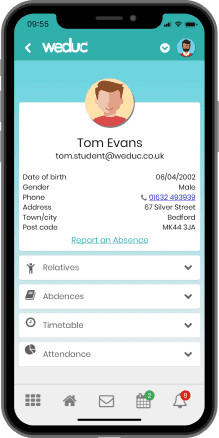 Create ‘self-service’ forms collecting data, which is accessible to Parents 24/7. 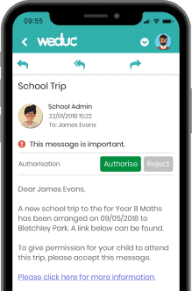 Send school surveys, change of address forms and consent forms, plus more. 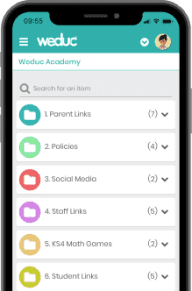 Create workflows, ensuring the correct stakeholders see relevant data upon completion of parent forms. Export data to third-party systems. 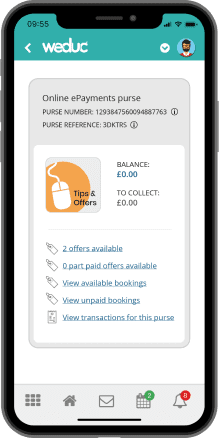 Acknowledgements, enabling App users to confirm receipt of a message. 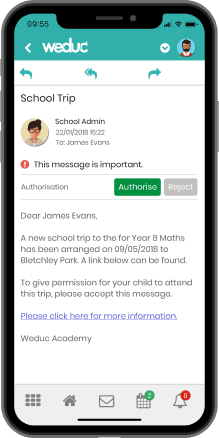 Authorisations, allowing parents to let the School know whether they are happy for their child to attend an activity. Invitations, providing office staff with confirmation of numbers that may be attending an event. Integrate with cashless catering services. Make payment without any additional registration or payment login. Chase late payments with targeted reminders. Linking content centrally from any online website or service. Indexing content and making it easy for users to find any item under one directory. Targeting groups where only relevant content is displayed. 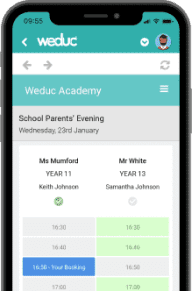 Take registers via the Weduc App, outside the classroom environment. Manage both Class, as well as AM/PM registers. Write back to SIMS with register codes and comments. Automate messages around register codes (such as N codes) and chase parents as changes occur. 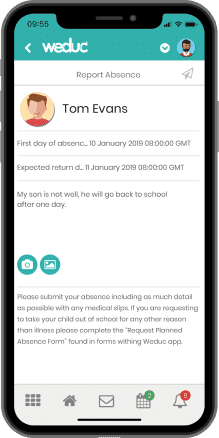 Allow parents to report absences with evidential attachments such as medical letters. 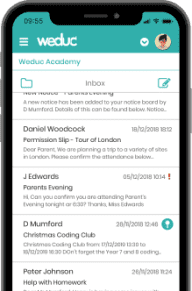 Write back to SIMS all communications and attachments whilst simultaneously changing register codes in real time. 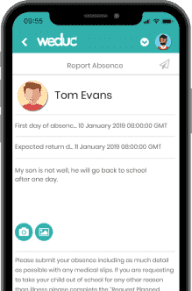 Manage planned absences with leave absence request forms. 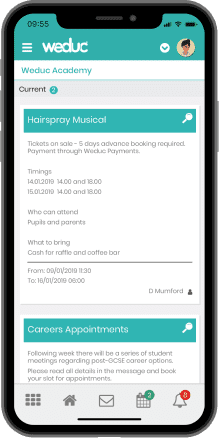 If you still have questions after viewing our site, or are interested in booking a demo, then please download our brochure or contact us below.